In an effort to encourage citizen participation, the Department of Transportation (DOTr) and the Inter-Agency Council for Traffic (i-ACT) will launch today a digital platform where the public can report smoke belching vehicles and other violations. The “Sumbong Bulok, Sumbong Usok” (SBSU) Hotline is a digital chatbot hotline that may be accessed via the I-ACT Facebook Messenger. With the SBSU Chatbot Hotline, around 45 million Facebook users in the Philippines may report vehicles that are no longer road-worthy, as well as smoke belching vehicles, colorum PUVs, illegally-parked vehicles, illegal vendors, among others. The platform will automatically enable netizens to post a photo or a video, and identify the location where the violation was committed through GPS. DOTr Secretary Arthur P. Tugade said that the digital hotline is a form of people empowerment, and a way to encourage citizens to actively participate in effecting positive change on public transport. “This Sumbong Bulok, Sumbong Usok Chatbot hotline is basically citizen empowerment. The success of this platform in helping realize the objectives of our “Tanggal Bulok, Tanggal Usok” operations will serve as a solid proof that if the government, its people, and technology are put into one, nothing is impossible,” Sec. Tugade said. The transportation chief likewise noted that the SBSU digital platform will push I-ACT member agencies to act on concerns expeditiously, given that a case management system is integrated in the platform’s back end. “This platform will not only help citizens send their complaints easily. This will also help our case managers and resolvers monitor the status of concerns. Makikita doon ng DOTr kung anong mga lugar ang pinakamaraming reklamo, at sinong mga ahensya ang hindi sumasagot sa reklamo,” Tugade added. “With this hotline, we will be expanding our enforcement of traffic rules and regulations through our law-abiding citizens. Lalawak ang coverage natin dahil ang mga tao mismo ang siyang tutulong sa atin,” Usec. Orbos said. Apart from the DOTr, I-ACT member-agencies such as the Philippine National Police-Highway Patrol Group, Land Transportation Franchising and Regulatory Board, Land Transportation Office, and the Metropolitan Manila Development Authority will be receiving, processing, and resolving reports and complaints sent to the SBSU Chatbot Hotline. 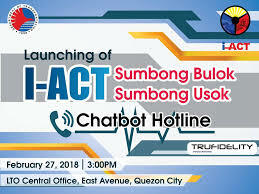 The Sumbong Bulok Sumbong Usok chatbot hotline is a project of DOTr, in partnership with Trufidelity Innovations, a private company who has offered to DOTr I-ACT free use of their digital media platform.